To see a world in a grain of sand, you can see the world we created from our works. https://www.youtube.com/watch?v=5kuN9kX7lMY Klas admires the culture of Artisan in a great deal as they always spend their entire life focusing on one thing only - the one thing they are passionate about. When Klas first discovered lampworking glass, he determined that this is what his lifelong goal should be. Glass works are something never aged, which can be kept over thousands of years. Klas hopes that what he created is not something like electronic waste but something people will think worthy and precious no matter how many years passed by. /dimension approx. 29 x 22.5 mm /material Borosilicate glass Opal Adjustable leather strap /lampwork Lampworking is a type of glasswork where a torch or lamp is primarily used to melt the glass. Once in a molten state, the glass is formed by blowing and shaping with tools and hand movements. 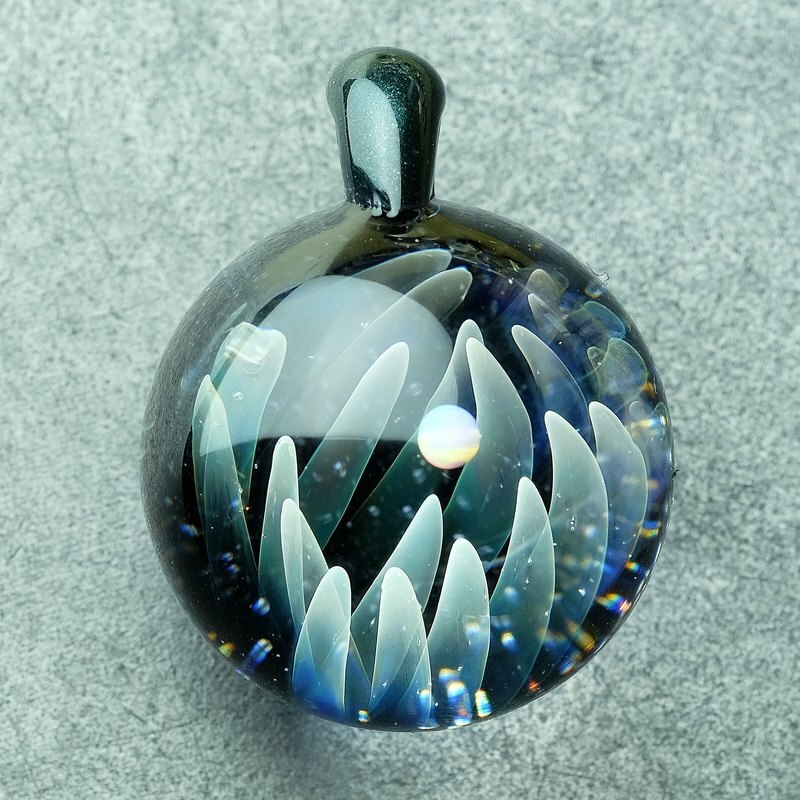 /fuming Fumed glass is created when a glass artist takes pieces of pure silver or gold and attaches them to a rod of glass. This rod is then held over a flame which works to heat up and vaporize the metal. Fumed glass can appear to be many different colors, depending on what light is reflecting off the piece and what metal was used in the fuming process. https://c1.staticflickr.com/1/446/18310200018_9b67298b81_z.jpg OOAK（One of a Kind） Every Klass Glass piece is handmade by Klas. Each of them is unique and slightly different even it has the same design concept. People who grasped the technique of flaming glass is not a majority nowadays, you can see many special artwork from our shop, which delicate to those who truly appreciate and see the beauty of handcrafted artwork. When the glass rod encounters temperature over thousands °C, it turns into lava-like and let the artisan to create different colours, patten, level and shape. @Please read the shop's sales policy. @All products are handcrafted by me. @Pictures were taken with studio light; there may be a slight difference in color as shown in different computer display.